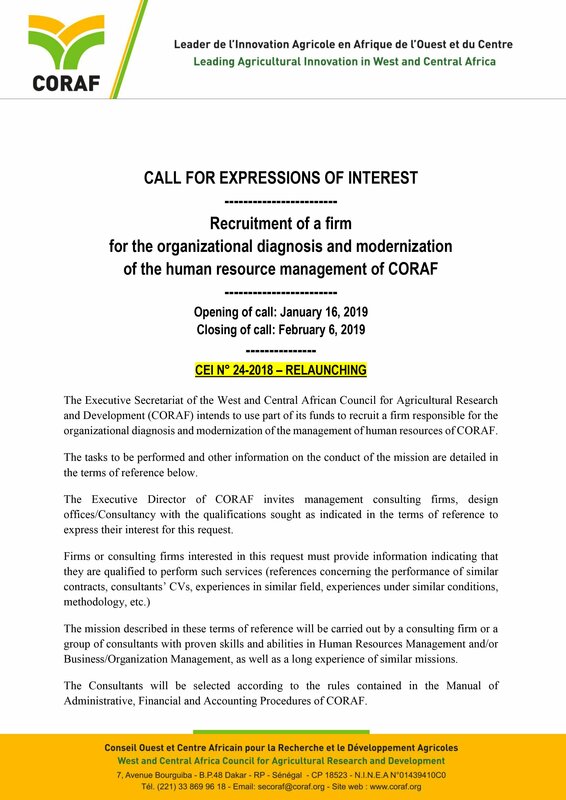 The Executive Secretariat of the West and Central African Council for Agricultural Research and Development (CORAF) intends to use part of its funds to recruit a firm responsible for the organizational diagnosis and modernization of the management of human resources of CORAF. The mission described in these terms of reference will be carried out by a consulting firm or a group of consultants with proven skills and abilities in Human Resources Management and/or Business/Organization Management, as well as a long experience of similar missions. Its mission is to ensure “sustainable improvements in productivity, competitiveness and agricultural markets in West and Central Africa by meeting the main demands placed on the research system of the subregion by the target groups”. As part of the fulfillment of its mission, CORAF has adopted a strategic plan, the implementation of which is currently underway. One of the major focuses of this strategic plan is CORAF’s commitment to providing a set of results including conventional research and the use of, inter alia, innovation platforms, policy research, capacity building and knowledge management with increased stakeholder involvement. To support this strong commitment of the strategic plan, the latter being itself implemented through an operational plan aimed at specific results, it became necessary to focus on the management of human resources, which constitutes an essential pillar for the success of any organization. To this end, CORAF is seeking expertise in the field of human resources management with a view to carrying out a comparative study of its salary scale, carrying out a diagnosis and evaluation of its human resources management system and making proposals for modern tools in line with international standards in the field of human resources management. The mission is part of the improvement of human resources management within CORAF, so that at all levels, employees fully assume their responsibilities in achieving the objectives of the organization. Make a current diagnosis of the human resources management system and propose improvements for better management of human resources (modern management tools, recruitment strategy, loyalty, motivation and performance management). On the basis of the findings/analyses of the diagnosis and evaluation, make proposals for modern tools in line with international standards in the field of human resources management. The pension system for expatriates is evaluated and a proposal is made. At the end of the work, the firm will submit to CORAF two (2) copies of its report including a roadmap for the implementation of the various actions in a hard copy and an electronic copy. The consultant must be a legal entity (management consulting firm, design office/consultancy, etc.). He must present a team with proven skills and abilities in Human Resources Management and/or management of companies/organizations. (It is preferable to specify the number of consultants with their profiles: an HRM and an organizational audit expert will be able to fulfill this mission). The duration of the assignment is thirty-five (35) working days. It will take place mainly at the headquarters of CORAF. The presence of the firm in the offices of CORAF is not required for the duration of the mission. It may occasionally work in its own office with planned/coordinated visits with staff at CORAF and, where appropriate, at the offices of similar organizations selected as part of the comparative study of the salary grid.